Memorial Day is coming up fast, and soon after that is the Fourth of July! 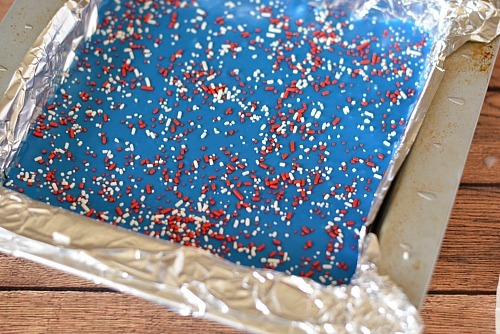 If you’re hosting a patriotic barbecue, party, or simple get-together, you’ll probably want a special patriotic dessert to serve to everyone. 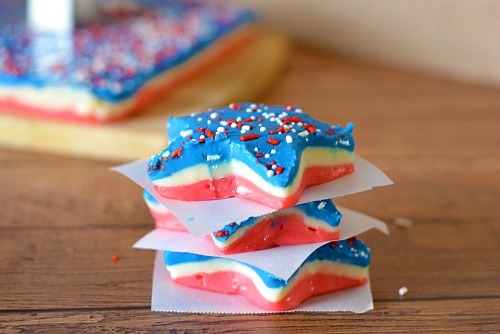 This Patriotic Red, White, and Blue Fudge is the perfect patriotic recipe! It’s delicious, easy to make, and can easily be doubled to feed a big crowd! 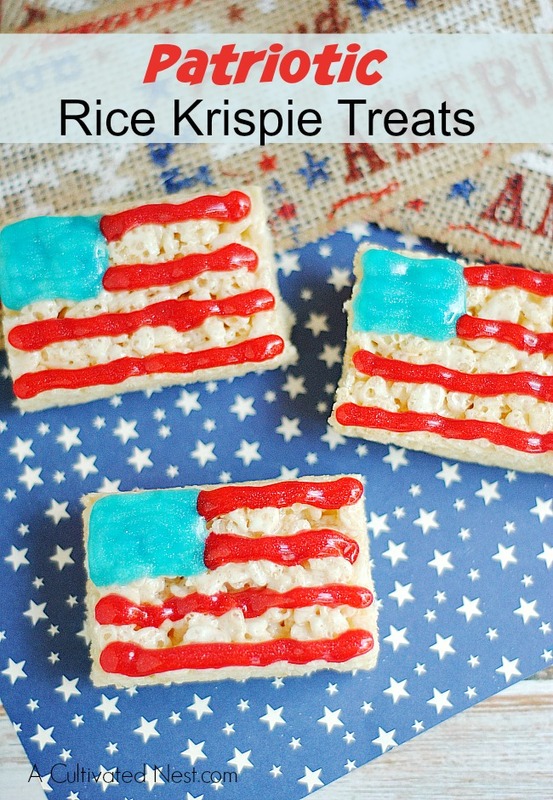 Since this is such an easy dessert recipe, your kids can help you put it together! They’d probably have a lot of fun adding the food coloring, or maybe even cutting out the stars! Makes 1 8×8″ pan of fudge. The star cookie cutter I used was about 2.5″ It’s a big cutter, so it cuts out a big piece of fudge. It may be tempting to use a smaller star, but it will be a challenge to get the fudge out of the cookie cutter as this recipe is pretty sticky. If you don’t have a star, I suggest cutting the fudge into long strips, because it will still be gorgeous but easy to serve. 1. 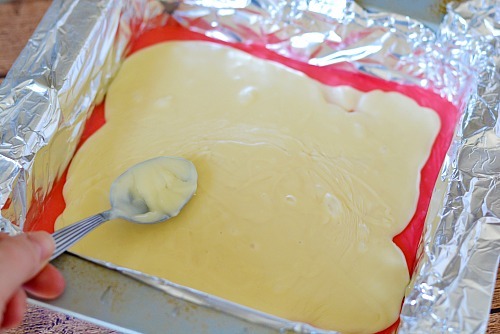 Place foil inside an 8×8″ baking pan. Now take that pan to your freezer and make sure there’s a space for it to lay flat. You can thank me later. 2. In a small microwavable bowl, add 1 cup vanilla baking chips, 1/2 cup sweetened condensed milk and 1 teaspoon vanilla. Microwave on high, for 20 seconds. Stir and microwave in 10 second intervals until completely melted. 3. Once all chips are melted, add red food coloring and mix until evenly combined. 4. Pour into prepared pan and place in the freezer for about 2 minutes. 5. Repeat for the remaining layers- white (without food coloring) and blue (with blue food coloring), freezing in between each layer. Sprinkle jimmies on top of the blue layer. 6. Place entire pan into the freezer for about 10-15 minutes or until cool. 7. Use a star shaped cookie cutter to cut into the fudge. The fudge is quite sticky so the struggle will be getting it out of the cookie cutter. Just slide it gently on all the corners and it will come out. 8. Serve on parchment paper because, as mentioned above, it’s sticky. 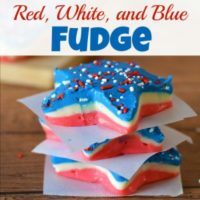 Then enjoy your patriotic red, white, and blue fudge! 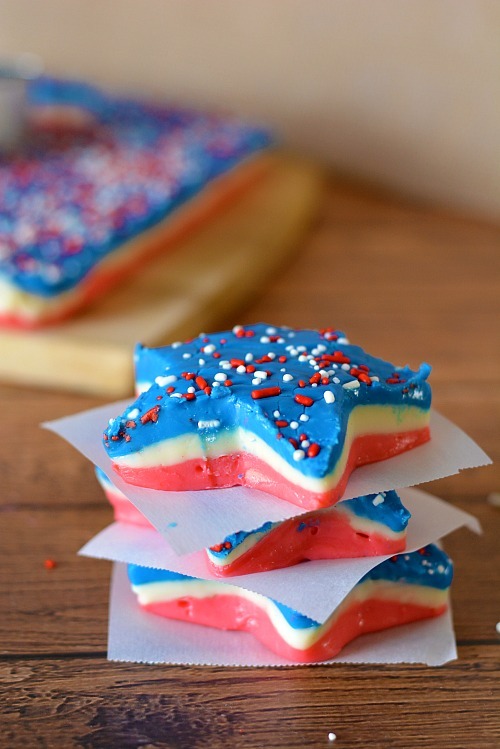 This patriotic fudge is very easy to put together, and so tasty! Place foil inside an 8×8″ baking pan. Now take that pan to your freezer and make sure there’s a space for it to lay flat. You can thank me later. 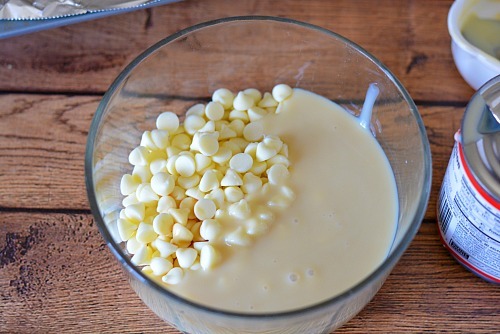 In a small microwavable bowl, add 1 cup vanilla baking chips, 1/2 cup sweetened condensed milk and 1 teaspoon vanilla. Microwave on high, for 20 seconds. Stir and microwave in 10 second intervals until completely melted. 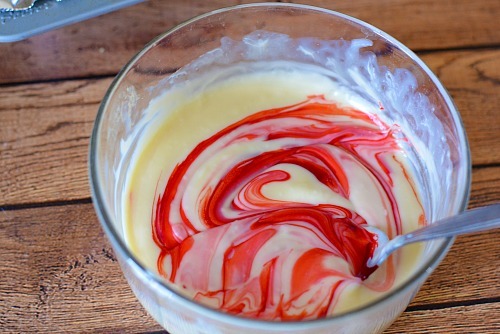 Once all chips are melted, add red food coloring and mix until evenly combined. Pour into prepared pan and place in the freezer for about 2 minutes. Repeat for the remaining layers- white (without food coloring) and blue (with blue food coloring), freezing in between each layer. Sprinkle jimmies on top of the blue layer. Place entire pan into the freezer for about 10-15 minutes or until cool. 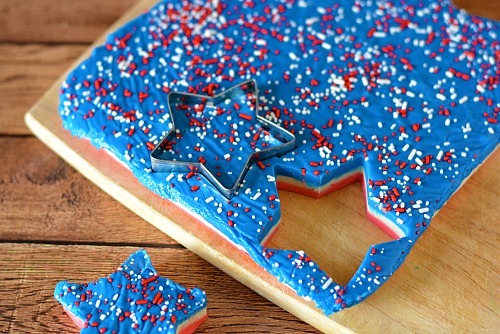 Use a star shaped cookie cutter to cut into the fudge. The fudge is quite sticky so the struggle will be getting it out of the cookie cutter. Just slide it gently on all the corners and it will come out. Serve on parchment paper because, as mentioned above, it’s sticky. Thanks for joining us at delicious dishes party! How festive and fun! Thanks for sharing on Welcome Home Wednesday, we hope to see you again this week.